On July 28th, BP announced a set of new sponsorship deals with the British Museum, the Royal Opera House, the National Portrait Gallery and the Royal Shakespeare Company. These four institutions – all of which have existing deals with BP – have agreed to bear the company’s logos for a further five years, from 2018 to 2023. We are a coalition of arts, research and campaigning groups who believe that cultural institutions should not provide cheap PR for oil companies. We have actively opposed these BP deals for many years, and will continue to do so. We cannot – and will not – allow BP’s logo to hang in our galleries, museums and theatres unchallenged. Wherever it appears, we will be there to expose the reality of the destructive drilling, human rights abuses, oil spills, corruption, political lobbying and climate change that lurk behind that innocuous green sunburst. Of course, BP isn’t the only oil company to sponsor arts and culture – Shell, Statoil and DONG Energy also have their dirty fingers in spaces like the National Gallery, Science Museum and Natural History Museum. We will continue to use art, performance and creativity to place all of these logos in their rightful context, and to undermine these companies’ efforts to use public arts venues as their promotional playgrounds. We will give a platform to those communities directly affected by oil company operations, bringing their voices into these spaces to drown out the corporates’ PR blurb. We know the tide is turning. Art Not Oil groups have successfully helped to end Shell’s sponsorship of Wildlife Photographer of the Year, the Shell Classic International concerts at the Southbank Centre and the climate change gallery at the Science Museum. The Almeida Theatre was briefly sponsored by BP, but following protests this deal was not renewed. This year, we kicked BP out of the Tate galleries and the Edinburgh Festival, ending decades-long sponsorship deals. Every one of these victories chips away at the power of the fossil fuel industry, reducing its public and political influence, and strengthening the hand of everyone around the world who’s pushing for cleaner alternatives and a safer climate. We’ve seen public opinion turning against oil sponsorship, with Londoners now opposing BP’s sponsorship of the British Museum by a wide margin. Two-thirds of the museum’s own staff want the BP relationship to end. By signing up to another five years of BP branding, the managers of these institutions are acting against the interests – and, we believe in most cases, the wishes – of their visitors and staff. The new deals will provide less than 1% of the annual income of these institutions, while tying them to a sponsor that British Museum staff have described as “unethical” and “bullying”. It doesn’t have to be this way. Even in these challenging times, we know a thriving, properly-funded arts sector, with secure jobs and decent pay, is perfectly possible – without the toxic distraction of this dribble of oil cash. Hundreds of artists and institutions have signed the "Fossil Funds Free" commitment, stating that they will never actively take money from an oil, coal or gas company. Many of us are artists and cultural workers ourselves, and we are working with staff in oil-sponsored institutions to call for ethical funding policies alongside better pay and working conditions. These things are possible, and worth fighting for. But we need your help. The groups in our coalition are planning our next wave of creative interventions – and the more people are involved, the more effective they will be. Whether you want to help create rebel art, attend performances, muck in on the production side or support from behind the scenes; whether you can help a little or a lot, as a one-off or for longer; we need you now more than ever. At a time when we need to urgently phase out fossil fuels to avoid unstoppable runaway climate change, the idea that the British Museum, the Royal Opera House, the National Portrait Gallery and the Royal Shakespeare Company will still be promoting an oil company into the 2020s is both irresponsible and deeply absurd. This decision already looks out-of-date, and will look more so with every passing day. We believe these deals can be ended well before 2023; in fact, they must be ended. With your help, we can make it happen. Contact us at info@artnotoil.org.uk, or via our Facebook group, to find out how you can help. 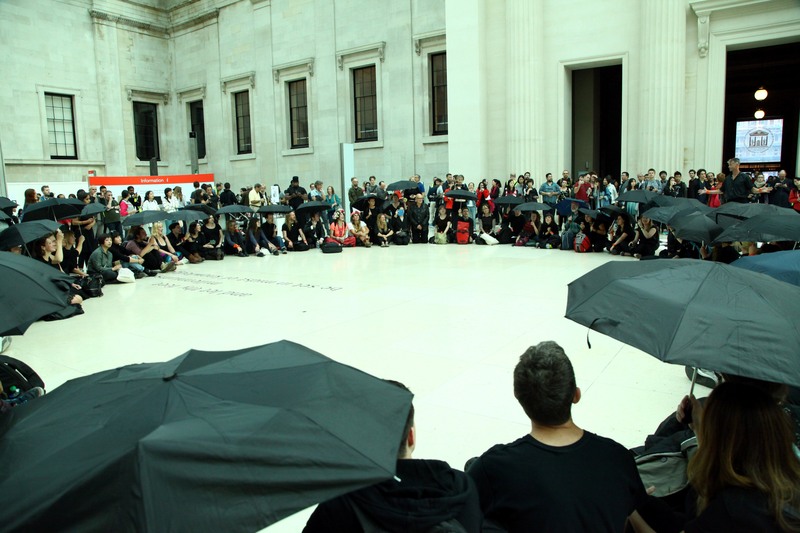 One of our member groups ‘BP or not BP?’ is holding a public undersea-themed flashmob (or ‘splashmob’) at the British Museum on September 25th 2016, to challenge the BP-sponsored ‘Sunken Cities’ exhibition. Everyone is welcome to join in – find out more information here, and email info@bp-or-not-bp.org to sign up.